Tuesdays, 6:30-8:30pm, February 17-March 24 (six weeks); ages 14 & up. No-strings-attached intro class! Absolutely no artistic experience required! 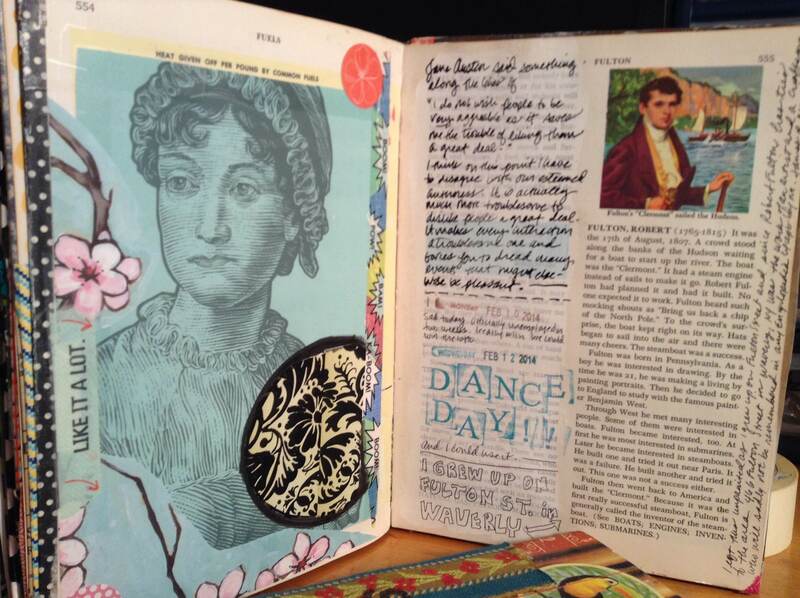 What is an art journal? Think diary, scrapbook, art practice, inspiration notebook, playground. Click here for more details and images. Experienced and motivating, Tara Finlay presents a stimulating exploration of this art form. All kinds of techniques will be covered—doodling with markers, painting, stamping, cut-and-paste collage, and more—no rules allowed! Come to the first week/introductory session (Tues, 2/17, 6:30p-8:30pm) to find out more. You can make a final decision at the end of that evening. For planning purposes, please let us know you want to attend the introductory event. MULTI-MEDIA ART for YOUNGSTERS, featuring CARTOONING with Noelle Dembrosky. Saturdays, 10am-noon, February 21-March 28 (six weeks); ages 6-10. Hands-on sampling of an exciting range of techniques, with emphasis on learning to see, and use of varied media including pastels, collage, pencils and paint. Materials included. Sunday, 12:30-4:30 pm, March 15. Thanks to a grant from the Legacy Foundation, TCFA has a very nice, new small printing press. Come explore its possibilities. We’ll be doing some printing so you can watch or try it out yourself. LEARN TO PAINT in WATERCOLOR with Marcia Eames-Sheavly. Tuesdays, 6-8:30 pm, March 31-April 21 (four weeks). A treat for spring! Over just four evenings, students will learn to paint with watercolor in a relaxed environment. You’ll be grounded in basic techniques, engage in experimentation, and loosen a hold on perfectionism. Some supplies required; list upon request. PLEASE register in advance—at least one week in advance if possible—to allow us to plan properly and to ascertain minimum numbers! Call 387-3717 or e-mail <corivogel@gmail.com>. Make checks payable to TCFA and mail to TCFA, PO Box 1053, Trumansburg, NY 14886.